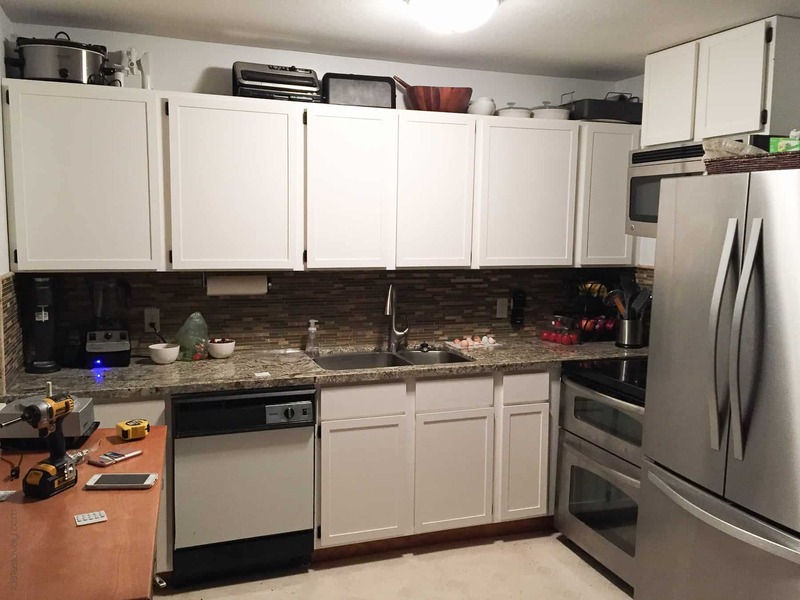 Our $281 DIY Kitchen Remodel – a home DIY project of painting oak cabinets white, adding wood trim to make flat cabinet doors shaker style cabinet doors, adding hardware, and a great hack to make your old, white dishwasher stainless steel for less than $50! We recently moved. RIGHT next door to my sister. It is a dream come true! Their property has a 2 bedroom house that we now rent from them. We share the same driveway. I can be at her house in less than a minute. And Josh now has his own room! And we now live in my favorite part of town. How lucky are we? It’s nice that it’s my sisters house, because she is letting us do little projects to make the house feel like our home. Shawn built a big detached shop for us to use for storage and Shawn’s tool shop, a chicken coop so we could bring our chickens with us, and we’ve done a few small things inside the house like painting the inside walls white, painting the bedrooms grey, changing all the outlets to be tamper proof (child safety! ), changing the ivory toggle switches to white rockers and adding in some dimmer switches, and changing all the door hardware from brass to dark bronze. We’re going to be here a while, so these small things make the house feel perfect for us. 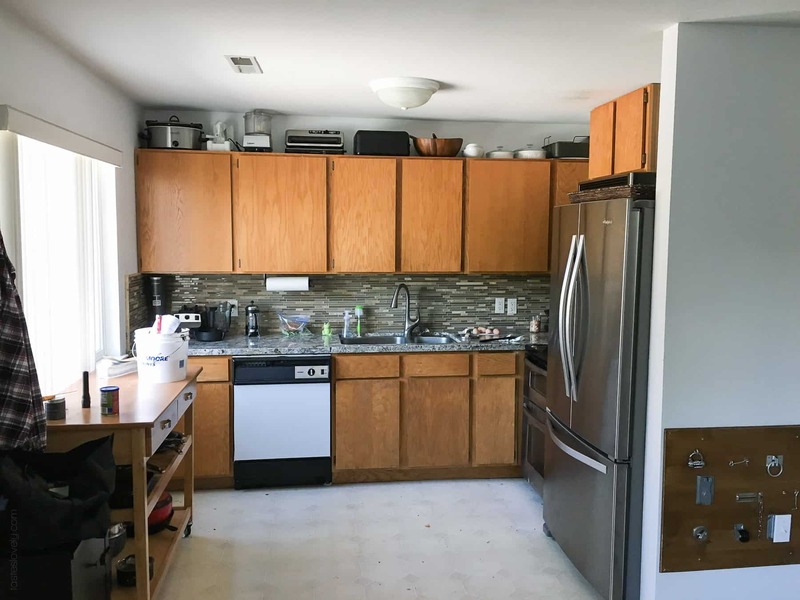 But the kitchen still had flat door, orangey oak cabinets that didn’t make me feel happy looking at them. The kitchen is the first thing you see when you walk in our house, and our living room looks right in to the kitchen. So I was staring at these oak cabinets a lot, and had to find a way to update them without breaking the bank. I had heard of people painting cabinets before. I did my research, and was really inspired by this online tutorial. I also wanted to update the flat front cabinets to something with more character. I loved this DIY shaker cabinet door tutorial, and thought that was just the finishing touch the cabinets needed. At first I wondered if this was too much work for Shawn to take on. Poor guy still works full time, and we’ve already started wedding season. I emailed around to see if I could find a company to paint the cabinet doors and bases for us. The best price I got was $2,200 to paint them, and no one would add the shaker style wood trim for us. I knew Shawn could do it all himself, and for a LOT less money. So he took on the project himself. Shawn removed all the doors to sand with 150 grit, and add the wood trim to make them shaker style. He used 3/16″ thick plywood that he cut to be 1.5″ wide for the shaker style wood trim. 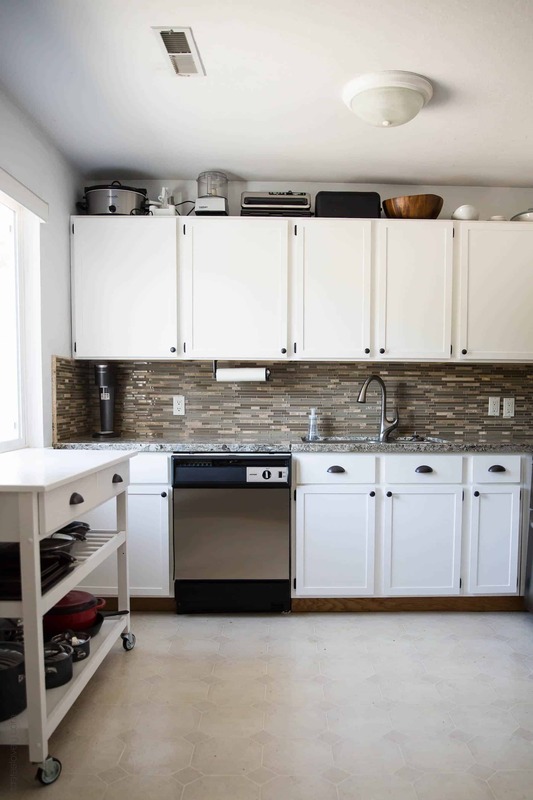 1.5″ seemed like the perfect width for our cabinets, especially since we have some narrow doors (like the one right next to the oven) and anything thicker would almost be touching on those ones. 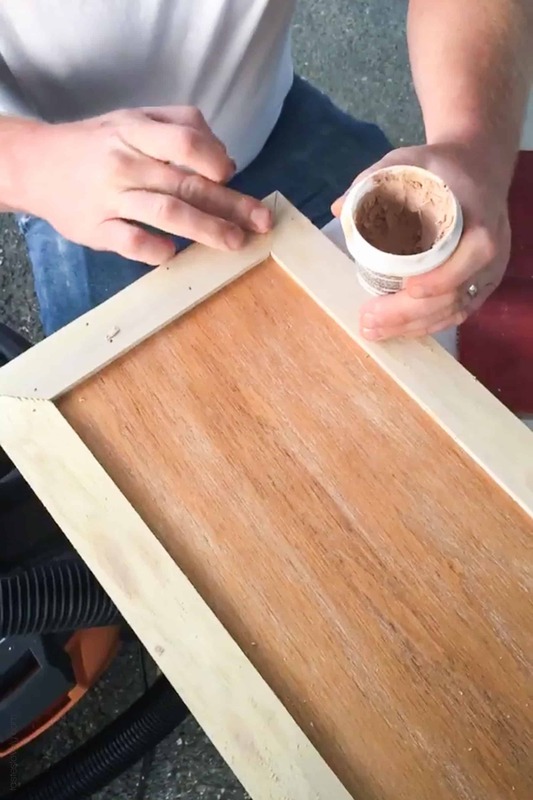 He then glued them on using wood glue, hammered in Brad nails, used wood putty to fill in the wood holes and seams on the outer edges, and silicone caulk for the inside seam. After that was all dry, he sanded it all again with 150 grit and the doors were ready! Then he sanded all of the drawers and the cabinet bases and applied 1 layer of Zinsser Bulls Eye 1-2-3 White Water-Based Interior/Exterior Primer on all the doors, drawers and cabinet bases. After the primer dried, he sanded the primer with 220 grit. It was finally time to paint! We used Kelley Moore Durapoxy 1685 in semigloss in the color Picket Fence and I LOVE it! Perfect shade of white for our house and the natural light we get. Shawn painted on 2 layers of the Durapoxy 1685. Shawn spray painted all of the brass cabinet door hinges black before reinstalling the doors. After seeing the doors installed, I knew I wanted to add hardware to the doors and drawers. I got these door knobs and these drawer pulls and I am obsessed with them. Amazing quality, and so affordable! To make it easy to install the hardware precisely he used this knob template and this drawer template. I also knew we HAD to do something about our dishwasher and it’s white front. At first I thought about getting a brand new dishwasher, but this dishwasher actually works just fine. Seemed like a waste of money to buy a new one. I saw online options to get this stainless steel adhesive paper that you stick on the door like a big sticker. But in the reviews everyone said it is a huge pain to put on and get right. I also saw this stainless steel magnet that you can stick on your dishwasher, but our dishwasher wasn’t the right dimensions. I was telling my sister and brother-in-law about the 2 options I had found, and my sister mentioned that the dishwasher door was reversible, and she thought the other side might be stainless steel. She was half right! On the edge of the dishwasher are screws you can loosen and slip out the sheet of metal. But ours was white on one side, ivory on the other. My brother-in-law said that I should just get a piece of stainless steel cut to the right dimensions at the metal shop he goes to for his automotive business. Genius idea! I went the next day, and they cut me a piece of stainless steel that fit perfectly for just $42! And it completely matches the rest of the stainless steel appliances in the kitchen. 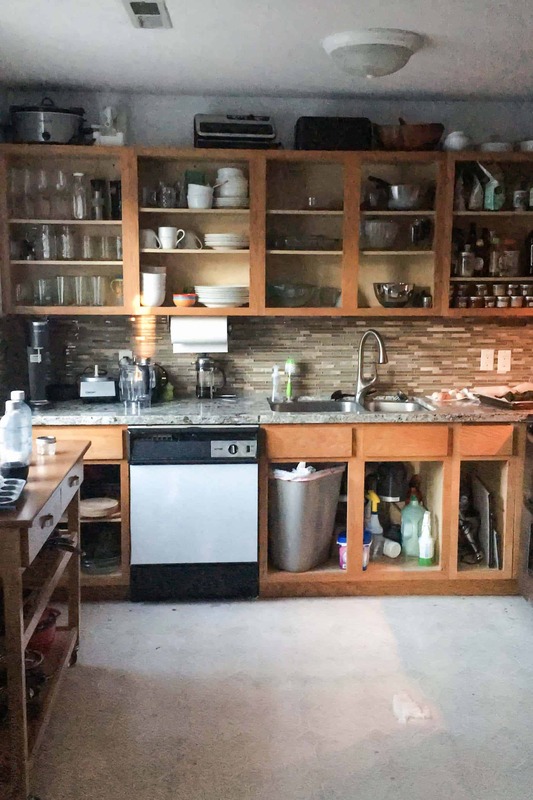 This is my absolute favorite hack we did in the kitchen. Shawn also painted that oak island cart to be white using the same method he used on the cabinets, and added hardware to it. My sister had bought the island cart at Target when she lived here, and left it for us to use. If we’re updating the oak cabinets, might as well update the oak island cart too! Here is the finished look! 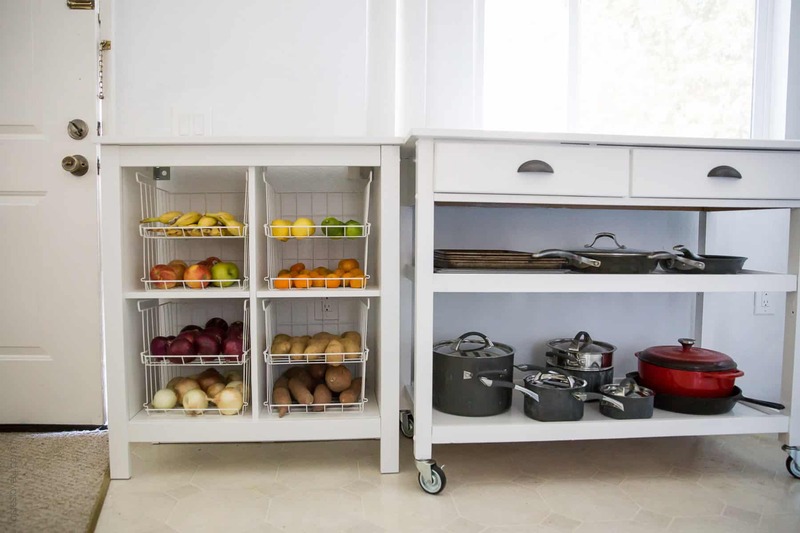 The white island cart, stainless steel dishwasher and the hardware make such a difference! 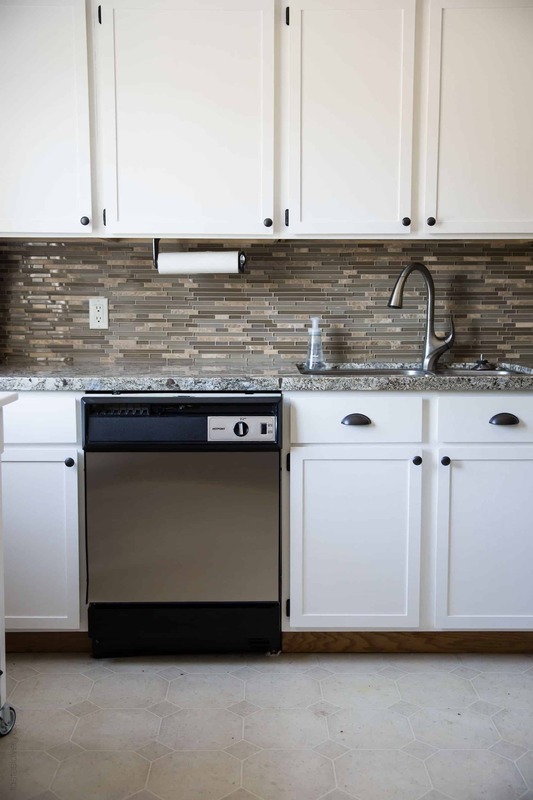 And see, the dishwasher matches the other stainless steel appliances just great. I made one other small purchase for our kitchen. 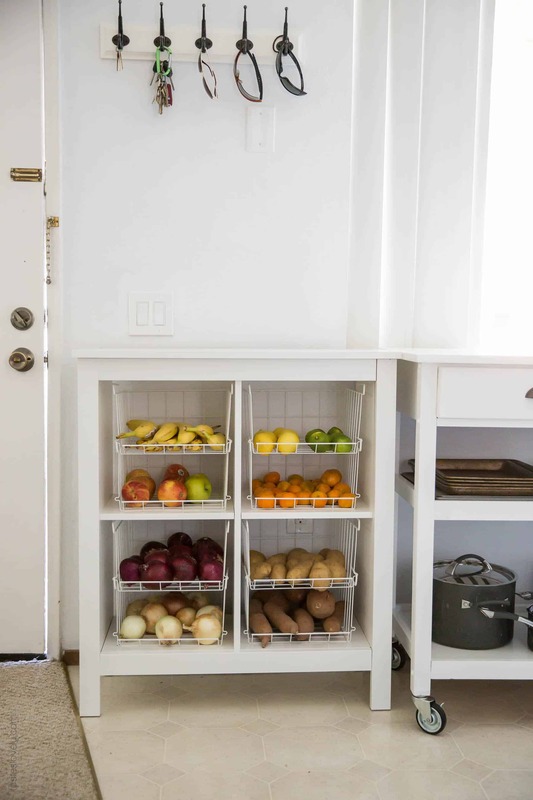 We have a little, bitty pantry, and I wanted to find more ways to add food storage. 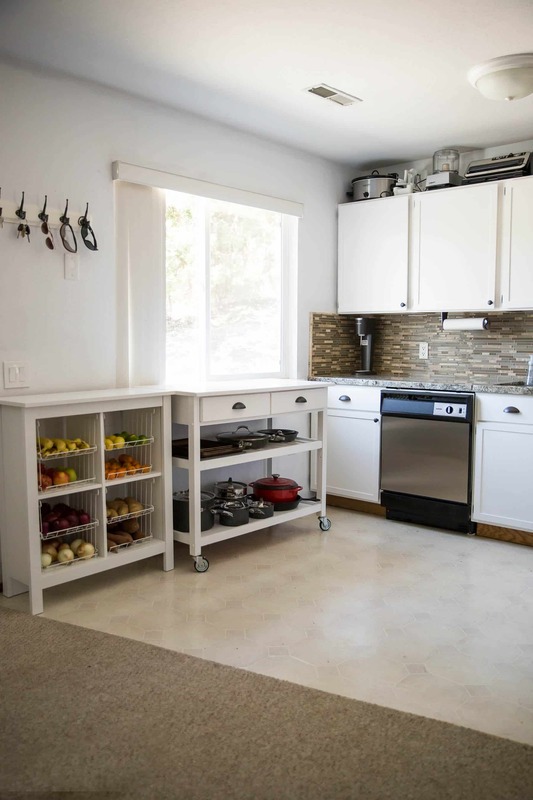 I found this white shelf unit at Ikea that would fit perfectly between our front door and island cart. I thought if I added in these wire baskets, I could use it for dry produce storage. I love how it turned out! Fits perfect, great way to store fruits, potatoes and onions. Plus, I think it looks kind of pretty. Adds some color to the kitchen. Josh is often going over and helping himself to oranges and apples and bananas, perfect height for him to reach healthy snacks. I put 2 wire baskets in each cubby and they fit great! I love our new kitchen oh so much. Now I feel exceedingly happy every time I look at it. It’s so us. And I love that Shawn did it all himself! He’s such a handy guy. He gets so proud when people come over and I tell about all the things he did to make our kitchen gorgeous. And it was SOOOO affordable! The whole project was pretty easy for Shawn, but he’s super handy. (His real life job is a handy man for the school district.) And it took him about 2 full weekends of work. All worth it for my pretty kitchen. Now it so calming and modern and clean looking. 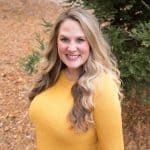 I’m one happy wife! None of the products mentioned are sponsored, just what we used and loved. All opinions are my own. We are not experts, just sharing what we did. There are a few affiliate links. Thanks for the love! I absolutely LOVE it, Natalie! So clean and bright. And so smart with the dishwasher makeover 😊 Looks like a kitchen I’d love to spend time in. Pretty impressive! What a difference and all for 281 bucks? Wow! should’ve did something with the floor it is amazing! Nowadays kitchen is not used by women only. It is more accessed by men :) So, all of us give more priority to remodel our kitchen. 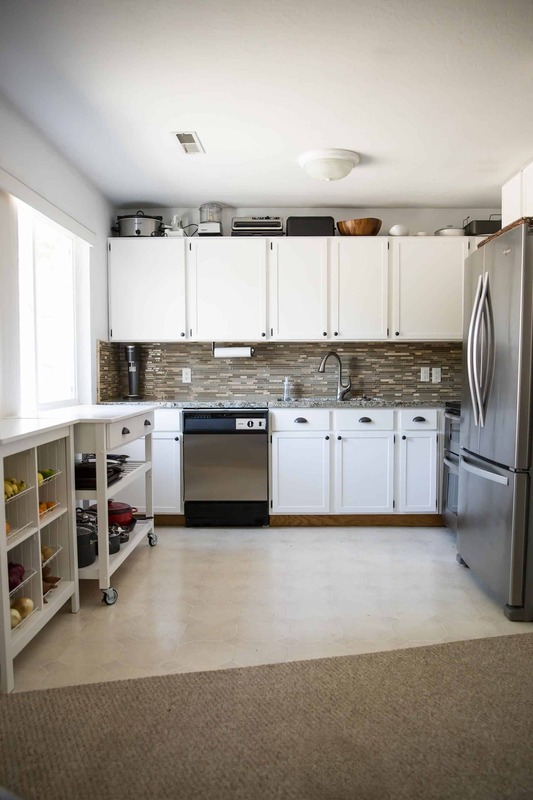 Fitting in the room with attractive cabinets offers the room a new look. 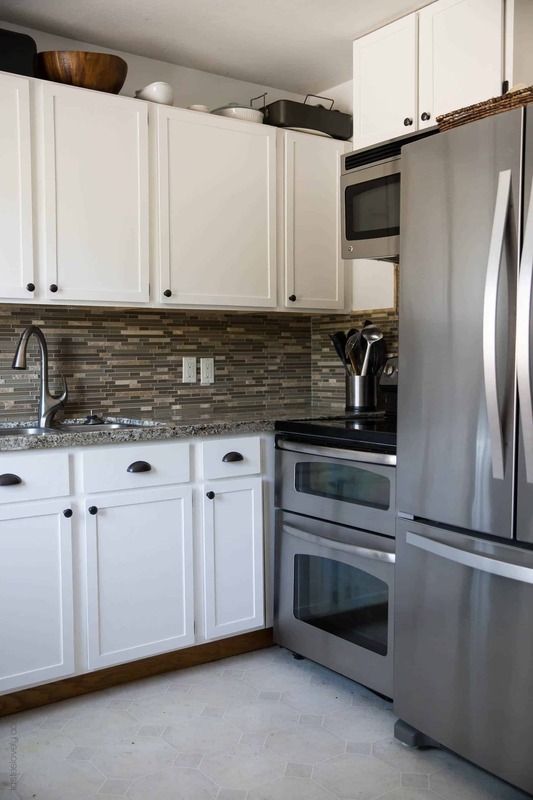 Color combination and the addition of high end electronic appliances augment the value of your kitchen. You may have choices but not the skills. 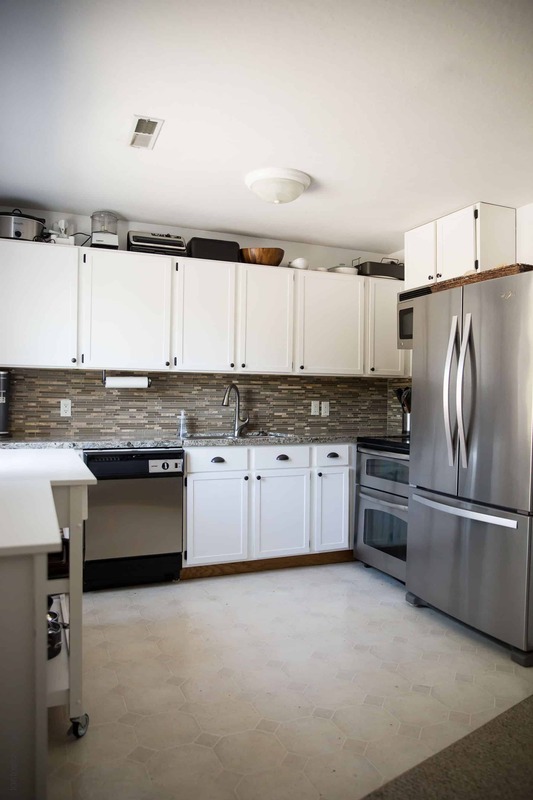 So, you must first find the best kitchen remodel company for your job. It will mesmerize you with its great services. Hey! So curious about how the paint held up over the last year! My husband and I want to do this next week but we are so torn about paint choice! Did it harden or is it still sort of soft? Does it show wear? Debating weather we should go with a tinted laquer or some other paint (heard Advance is a good option or an alkyd paint). It’s held up great! I’m shocked! It hardened nice and hard. I use those Magic Erasers to wipe it down every once in a while if they get dirty and it’s held up great. And I have a 2 year old constantly banging and throwing things at the cabinets, haha!